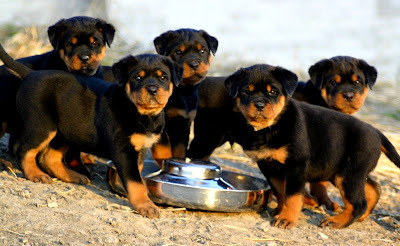 The first and most important thing that contributes to your Rottweilers health is the food that you feed him or her. Depending on the age of the Rottweiler, they need a certain amount of meat and nutrients to keep a balanced and nutritious diet. You can choose to feed them food from the store or you can make your own if you have the time. Learn how to read the labels on the dog food before you purchase one. It's important that the source of protein, whether it be chicken, lamb or beef, is the first ingredient listed on the label. If your Rottweiler has allergies to certain things, that's something else you need to keep an eye out for.